“In the first phase, we used symbolic street actions. Small number of people would organize the action, which would symbolize the problems they were facing in their own towns. These actions were not something that were too dangerous, so people could easily join and by doing that they could show that they were not satisfied with the situation in the country. With these actions that had a dosage of humour and laugher we managed to break away fear which was the main problem facing [them] under Milosevic’s dictatorship. In early May the political front shaped up with the emergence of a unified Opposition coalition; eighteen political parties merged into the Democratic Opposition of Serbia (DOS). 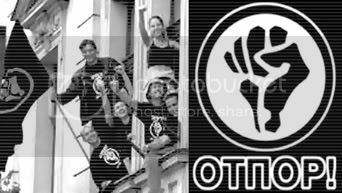 By this time, Otpor itself was ready to challenge the President directly; in the two years since the group’s inception, it had grown to at least 70,000 members, a force to be reckoned with. The police fought back, but no matter what the authorities did, the movement just got bigger. Thousands of young protesters were arrested. Perhaps hundreds were beaten and interrogated, but the movement’s leadership proved tough to ferret out; Otpor prided itself on the fact that the group had no single leader or hierarchical structure, which rendered ordinary suppression nearly impossible. On July 17 Milosevic, having pushed through Parliament a constitutional amendment that would allow him two more terms as president, announced early elections scheduled for September 24, perhaps afraid his popularity would fall after that. As the political opposition moved towards greater unity, Otpor focused on securing the upcoming elections for the opposition. Their prime achievement to this end was their 2000 Gotov Je (“He’s Finished”) pre-election campaign. Over two million stickers announcing this belief were placed around Belgrade and elsewhere to mobilize as many disaffected voters to the polls as possible to vote their conscience – this time they weren’t going to let it be stolen.